This is a classy way to promote exhibitions and extend the value of your art work. I love the trailer trend. Just want to say that I am really enjoying this new practice of museums and artists making video previews to promote their upcoming exhibitions. Very entertaining and, apparently, very effective. For instance, last year, I was pretty excited for the Carnegie International, but when they started dropping intriguing and crisply edited trailers a few months before the show opened, my excitement turned into unadulterated obsession. Have a look at them. Really great. Redline Gallery/Art Center/Cultural Center is all of that and more. There’s a community going on there. It’s where artists (professional, students, the homeless) meet and do what comes naturally to them, create their art. The space is open and inviting with wonderful, contemporary and oftentimes edgy art. Always spectacular pieces that evoke wonder, discussion, beauty, curiosity and contemplative thoughts about the world of art. It opened in 2008, as more than a simple art gallery. Laura Merage, artist, is the founder of RedLine. The non-profit contemporary art oasis contributes and supports Denver art education within an inspired center for artists and art lovers alike. Last Thursday night the celebration was focused on Laura Merage and her supporters such as Vicki & Harry Sterling, Mickey Zeppelin, Mary Louise Lee, Patricia Barela Rivera, Ed Romero, Vivian Le Courtois, Helen Thorpe, Theresa Anderson, Dillon Scholinski, Kelly Carswell, Bill Havu, Jayne Buck, Greg Carpenter, Afsy Levy, Joanne Davidson, Justin Beard, Julie Lizak. This night RedLine was transformed into a wonderland of colors, shapes, shadows, light shows, drinks and food. The crowd was so happy to be together it took several pleas for everyone to sit at their tables ‘so the program could get underway.’ No one paid much attention. It was too much fun talking and sharing their input for Laura Merage and her dedicated, driving force behind RedLine. Her simple mission of improving the world has been met. Located in Five Points, RedLine is an innovative, mixed-use arts space that combines an artist residency program with project-based community engagement in the arts. 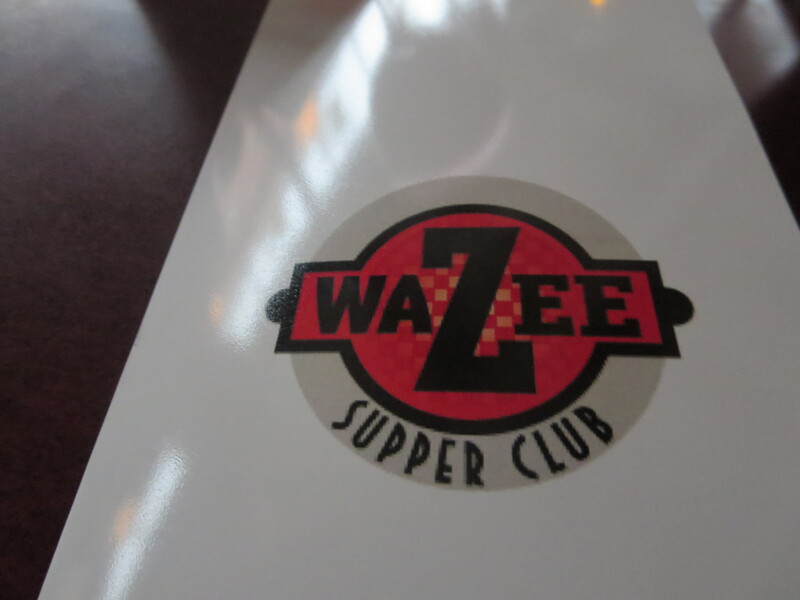 Dining at the Wazee Supper Club as 15th & Wazee, as the world goes by outside. Last winter I rediscovered the old/new Wazee Supper Club and found it to be the best place for Jazz in downtown. The old haunt has a deeply ingrained history. Like most of the history in this part of downtown, I found that little has been done to the 1881 Bon Ton Saloon since 1898. After the Bon Ton closed people continued to live above the saloon in small rented rooms. Not until 1954 did the building return to its original use with the opening of the Wazee Supper Club by proprietors James C. Capillupo and Albert R. Rotola. The partners had a decent run with the restaurant/bar until 1974, when brothers Angelo and Jim Karagas, owners of the legendary My Brothers Bar, added the Wazee to their eating establishments. It was a good fit. Brothers sits on the corner of 15th & Platte, the Supper Club is at the other end at 15th & Wazee. Most people will ask, do you remember when this was under the 15th Street viaduct? The historic urban corner has rallied in the last ten years with new condos and businesses. Once again it is a friendly neighborhood hangout much like it was in the 1880’s when it was the Bon Ton Saloon. The fresh, old-newness of this historic space is understated. 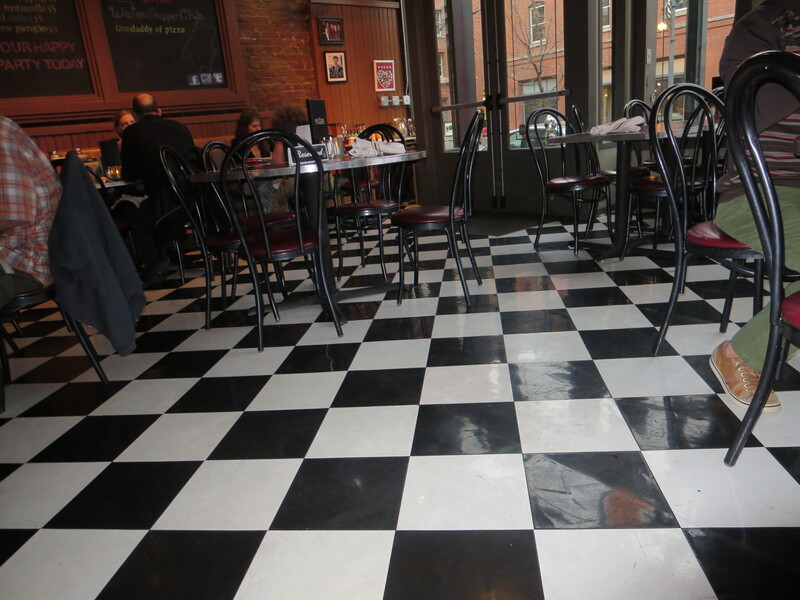 The original black & white floors and dark wood paneling cast a delightful spell over the dining room & bar. There is an extensive selection of craft beer, wine and mixed drinks. 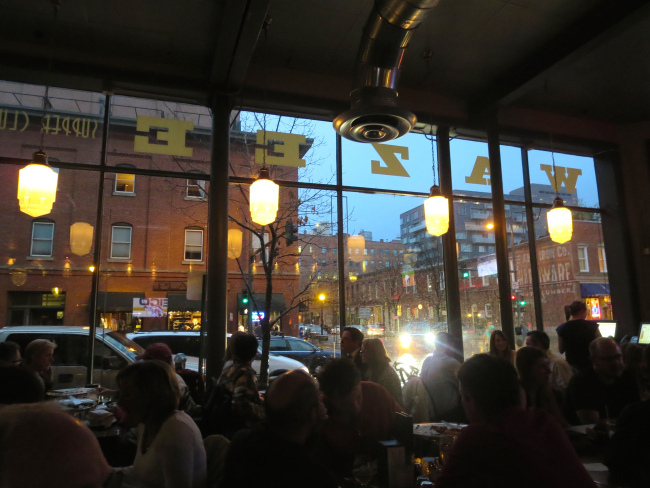 Sitting inside watching Denver go by sets the tone and makes one feel as if you are one of the in-the-know-folks who frequent this stylish, vintage eatery and bar. On the night we decided to experience a real meal at the Wazee, it was raining. There’s just something about watching Denver in the rain and probably the reason we decided to eat like the rich and skinny. We never order an appetizer, but this night we ordered the grilled polenta that is paired with an Italian, garlic herb red sauce, it had a distinct grilled flavor I loved. This small plate was more than enough for two people. I hate to admit it but I am not a huge fan of salads, but for Chip we ordered The Wazee Salad and split it. It was plenty. The locally grown salad and veggies had a mixture of goodies to satisfy my crunchy, sweet, tart taste craving. Since I rediscovered this comfy place, I’ve longed to have a pizza but I need the gluten-free crust and usually, I’m the only one at the table who isn’t eating with abandon. To avoid explanations I usually just order their superb french fries (crisp, hot, perfect). 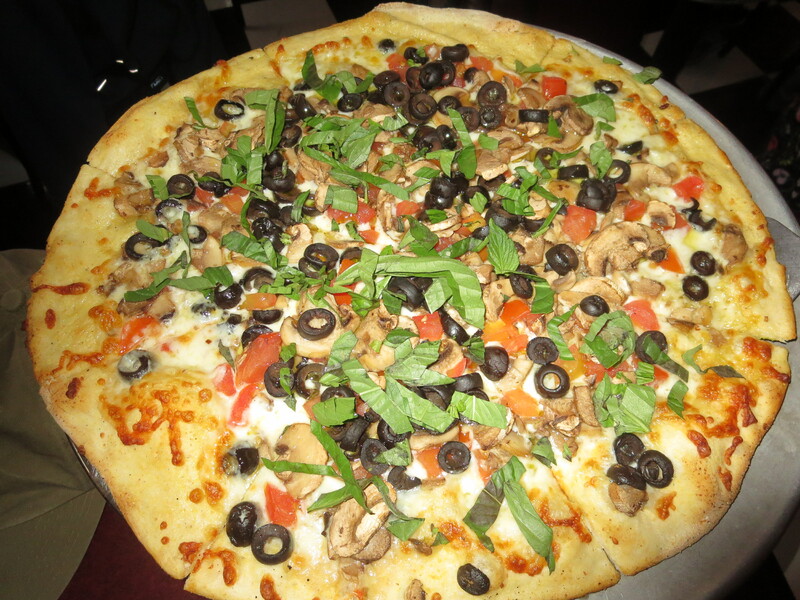 This night Chip ordered The Bianca pizza with added toppings. 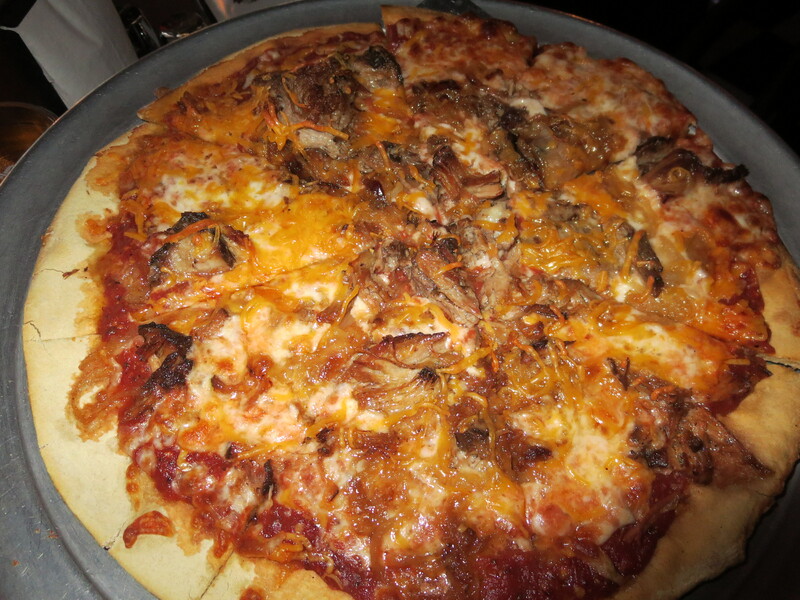 I had a hankering for the BBQ pulled pork with cheddar and caramelized onions on a gluten-free crust. The tangy, sweet, smoky BBQ flavor was subtle, but not too much so and was a perfect match for the slow-cooked pulled pork. The crust was one of the best G-F crusts I’ve ordered in a year. Thin, tasty and crisp where it should be. I asked about the crust. Chef Bob said he orders all their gluten-free products from a bakery in Longmont. The Bianca and the BBQ pulled pork pizza. No jazz on the Wednesday we visited. The jazz jam will return next fall and I must tell you, it is seriously one of the most sophisticated and delightful evenings one can spend in downtown Denver. The crowd is made up of low-key, local jazz lovers and musicians who gather to listen & play music. Often times a visiting musician will join the ever changing group with a song or instrument. Jazz musicians Bob Montgomery and Al Hermann form a group made up of professors, scientists and musicians who love to chat at your table and tell stories of recent gigs in Russia, Chicago or the White House. Since I am from Arkansas, one musician delighted in telling me about the night he let Bill Clinton sit in on his gig. Jazz musicians get around all right. Arriving at the corner of 15th & Wazee is no problem. After 6:00 p.m. street parking is assured, but, be aware of your parking meter time. Last winter, as we listened to slow jazz with a glass of wine, watching the snow fall on downtown Denver I watched one of the wait staff jump up from her stand, bolt out the front door, run down the street without a coat, to put money in our meter. Now that’s what I call hospitality.